Asking this question here, still not certain if this is a CM / RPI issue or not. 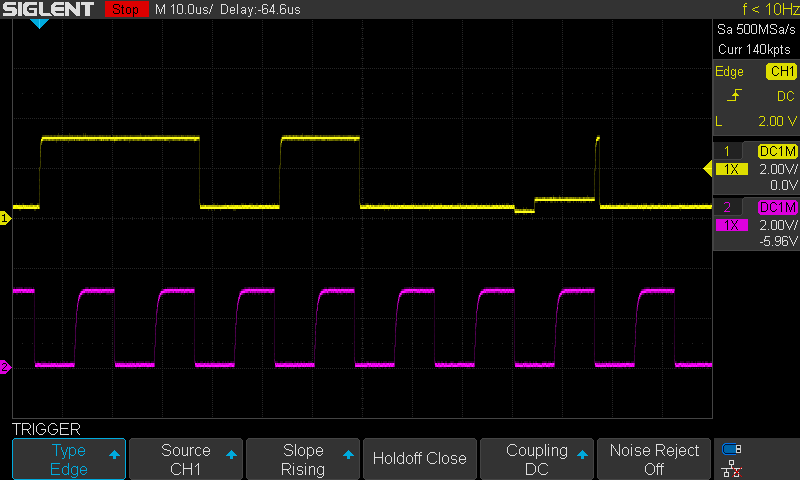 I thought it might be a problem with the I2C device itself (in this case an audio codec). But I've observed the behavior on 2 different slave device: the TLV320AIC23B and the compatible WM8731. They are connected by 3" jumper wires (4 wires SDA, SCL, PWR, GND). There are 4k7 pull up resistors on the master side. When I add 220 Ohm series resistors to SCL and SDA at the slave side, the problem goes away completely, but trying to understand why. I do not understand what you mean by "When I add 220 Ohm series resistors to SCL and SDA at the slave side". I guess one side is connected to SDA/SCL. What is the other end connected to? series resistors, Rs in this pic. Thanks for this info. Removing pull-ups I can still see some activity on SDA and SCL, but not really spikes. I thought I read that GPIO 2 and 3 have weak internal (50k?) pull-ups, and what I see is in line with that, very slow rise times that do not make thresholds. Just to rule out GPIO 2 and 3 contributing to the problem, I moved i2c1 to GPIO 44 and 45, but I get the same behavior as original post. How did you wire everything to up. And what for wires are you using. Maybe a picture of your test setup? Did you try a lower value resistor for the pull up (1,8k)? And is your clock speed within the specifications of the IC that you are using? Last edited by John Westlake on Fri Sep 21, 2018 4:03 pm, edited 1 time in total. John Westlake wrote: It really does look like some kind of pull-up is being released one clock period prior to the successful ACK. During the ACK it pulls all the way down for about 1/4 of the time, then lifts back up again. Is this what you were referring to? Last edited by oweno on Fri Sep 21, 2018 6:22 pm, edited 3 times in total. Can you do also the same test. Without the 200 ohm resistor. Last edited by oweno on Fri Sep 21, 2018 6:10 pm, edited 2 times in total. Brandon92 wrote: Maybe a picture of your test setup? Here are 2 photos of test setup, with and without probes attached. The bottom board has the WM8731 audio codec. It also has socket for Compute Module, but wanted to take that out of the equation, so driving the board with the standard CMIO board. Okay, if I see the last image that you sent. I thing the problem is with the CM3 module. This is because when you send the data to the other IC. The voltage level doesn't go down to 0V. Unlike your clock. And the ack that is provided by the IC can pull the bus correctly low. And are your wires not damaged, or are you using a breadboard? I see that dat you are using a other pcb for this test. Does that thin wire deliver enough power to the circuit. Because, I measured a couple weeks back the resistance of that wire. And it was more than I though. Do you have another I2C device available, i.e an EEPROM? maybe you should crosscheck with another device if your I2C is working at all. Why do you add fhese series resistors? You also might be better off with pull-ups in the range of 1k8 to 2k7 Ohms (rather than 4k7). "The WM8731/L supports a 2-wire MPU serial interface. " 1. Pull Up/Down only present when Control Register Interface ACTIVE=0 to conserve power. " aBUGSworstnightmare wrote: Do you have another I2C device available, i.e an EEPROM? Good point, should try another I2C device, although I have tried multiple boards / parts, so I'm pretty sure it is not a problem with specific part or CM. Also I get same result from both WM8731 and TLV320AIC23B, pin compatible devices from different manufacturers. aBUGSworstnightmare wrote: Why do you add fhese series resistors? This is really the question, why are the resistors necessary? I was reading series resistors like this can be used to filter noise picked up on I2C lines which is why I tried them. And while they do make it work, in this simple setup they should not be necessary. I haven't been able to capture any noise or spikes, so makes me think something else going on. aBUGSworstnightmare wrote: You also might be better off with pull-ups in the range of 1k8 to 2k7 Ohms (rather than 4k7). I was wondering about this. But it might also be a licensing thing. Might be worth a shot, but they don't have that note listed next to the control interface SDIN, SCLK (I2C) pins. I already have MODE and CSB externally pulled low. Thanks for everyone for looking into this btw! Last edited by John Westlake on Sat Sep 22, 2018 3:24 pm, edited 1 time in total. Ok, maybe we have been looking at this all wrong, looking at your PCB design and I cannot see from the Low Res Picture any High Frequency PSU decoupling near the Digital PSU pin DBVDD - you could try placing a 100nF High Quality (= Low Inductance) Ceramic capacitor DIRECTLY across Pin 1 DBVDD and Pin 28 DGND (so across the top of the package with shortest leads (Maybe a SMD cap with a shortwire end attached to one side to stretch over the device). Interesting about Cirrus Logic, what was your patent for? I double checked all the power pins were connected early on, wishing it was something like that. But I'm glad you mentioned about PSU decoupling. There is a 100nF cap between DBVDD and GND, but the location is really not right. It is C55 in the attached close up. You can also see a jumper wire connecting DVDD (27) to AVDD (8). Another thing the datasheet says is 'DVDD must be less than or equal to AVDD'. DVDD is 3.3V and I was running AVDD from separate 3.3V regulator... so should be fine, but got paranoid, what exactly do they mean 'equal'. so removed the AVDD regulator and jumped them together to be sure, but didn't change anything. I am traveling for 2 days, but excited to try better decoupling cap when I'm back in at the office. WRT voltage differences between Analogue and Digital rails - anything less the one diode junction voltage is Ok, if you have separated supply's (which you would want with Digital / Analogue domains) - then a pair of cross connected Schottky diodes across the two rails will insure correct conditions are always met during power cycling / operation etc. I think we need to see first the output signals of the module it self. So, without any device connected to the data bus. Than we can see why the voltage is not 0V. And this is well good by the clk. I, also saw it the datasheet that it is a I2S data bus for the WM8731. And that is not the same as a I2C bus. So, praheps the communication between the two devices are wrong and want to "talk" at the same time to the data bus. And this could conclude why you see <0.6V at your databus when its "low". Because the Rpi thinks it is a x bit data bus. But, the the WM8731 has a audio data input between the 16-32bit. Brandon92 wrote: Than we can see why the voltage is not 0V. And this is well good by the clk.